The Poodle originated in Germany as a water dog. The patches of their coat left to grow longer where placed over specific parts of the body that needed to keep warmer while in the cold water. The Poodle can come in many colors including white, black, apricot and gray. Each one must be solid color, no part-coloring is allowed. This breed also comes in three sizes, the standard size which has a life expectancy of 11-12 years and stands over 15 inches tall at the withers, the miniature size which has a life expectancy of 14 to 15 years and stands over 10 inches but under 15 inches tall at the withers, and the toy size standing under 10 inches tall at the withers which has been known to last into their 20’s. The standard size is regarded as the second most intelligent breed of dog, falling right after the Border Collie and right before the German Shepherd. Poodles have a single layer coat which is dense and curly. While they shed minimally, their coat does continually grow causing it to tangle or mat unless groomed regularly. The AKC recognized the Poodle in the Non-Sporting Group for Standard and Miniature sizes and the Toy Group for the Toy size in 1887. The three available sizes probably accounts for the breed’s popularity. Our Pen Sets are perfect for anyone’s desk. 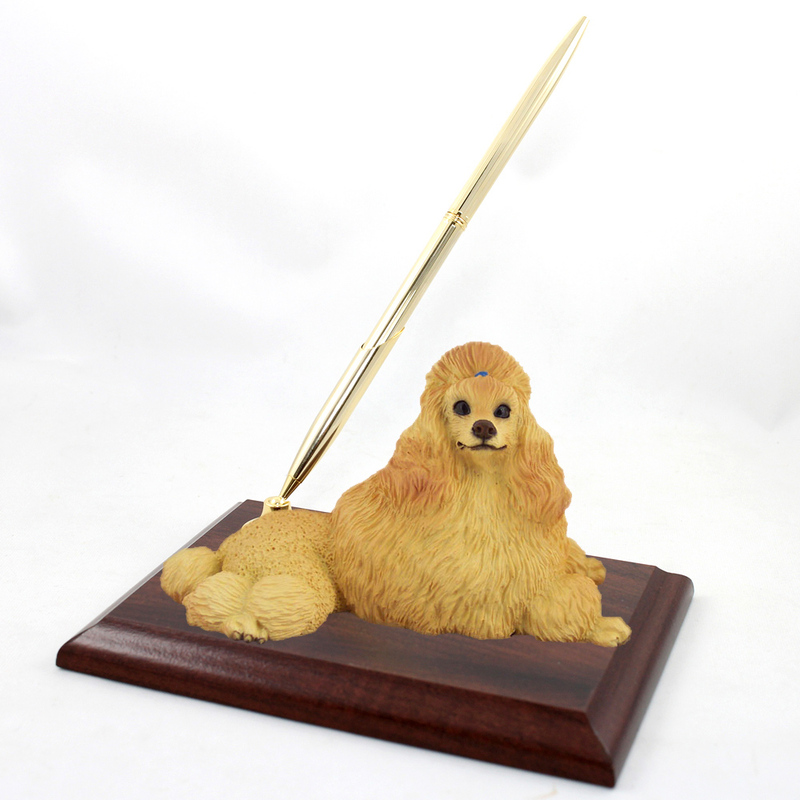 Each pen set comes with a walnut finished base, measuring 4.25" x 6" x .5" thick, a gold tone pen holder, a gold tone (blue) ink pen, and a 4"-5" figurine.